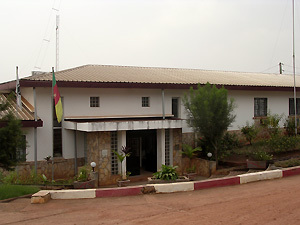 On February 16, 2005, at WWF-Cameroon in Yaounde, the capital of the Republic of Cameroon, the “Workshop on the Baka hunter-gatherers and Bakwele Farmers in the Jengi South East Cameroon” was held under the joint sponsorship of the Cameroon Field Station and WWF-Cameroon (Photo 1). First Dr. Leonard Usongo (WWF), who is in charge of the conservation project in the South East Cameroon described the objective of the workshop, and this was followed by a brief self-introduction by the participants. 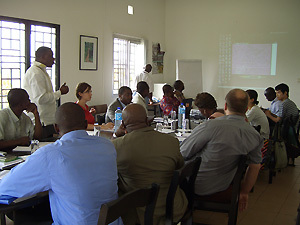 After the screening of video footage on the conservation project of the area (Photo 2), four graduate students doing fieldwork in the Jengi South East Cameroon (three from ASAFAS and one from Yaounde University Graduate School of Humanities and Social Science) made presentations of their research achievements. Questions followed each of the presentations and all the participants enthusiastically conducted discussions on how to integrate their research outcomes into the practice of the conservation of the area (Photo 3). A research team on the African tropical rainforests, mainly based at Kyoto University, has conducted researches on the Baka hunter-gatherers and shifting-cultivation farmers in Southeastern Cameroon since 1993. The WWF, in order to conserve the forests in Southeastern Cameroon from logging and from poaching, which has become increasingly common accompanying the former, has been implementing the “Jengi Project” since 1998 together with GTZ (an aid organization of the German government) and MINEF (Ministry of Environment and Forestry of Cameroon). In the past, Japanese researchers and people concerned with the nature conservation project informally exchanged opinions integrating the nature conservation project and the livelihoods of the local people. 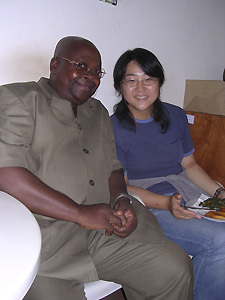 In response to the strong desire of the project members to formally conduct exchanges with Japanese researchers who have carried out work in this area over a long period of time, the first joint seminar was convened in Yokadouma, the capital city of Boumba-Ngoko Division, East State of Cameroon in December 2003 (For details, see the report of the previous local seminar). 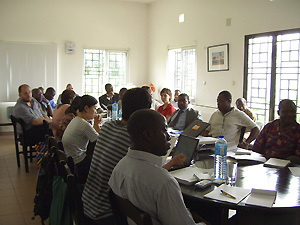 This joint seminar, the second of these formal exchanges, was held in Yaounde, the capital of the country, and was participated in by some 30 people representing a variety of fields and capacities, including not only those engaged in the “Jengi Project” but also researchers, specialists and coordinators promoting projects in Cameroon on nature conservation and the development of the neighborhood areas, as well as Dr. Ngima-Mawoung of Yaounde University, the counterpart of the Japanese research team, Dr. Jean Michel O’nana and Dr. Barthelemy Tchiengue, botanists with the National Herbarium, which helps the team to identify plants, Dr. Kai-Schmidt, a German consultant who visited Japan to give a lecture at the ASAFAS-sponsored “Refugee Symposium” under the 21st Century COE Program in October 2002, Dr. KANAI Tamana, medical officer (a staff member of the Japanese embassy in Cameroon in charge of forestry problems), as well as graduate students of Yaounde University and ASAFAS graduate students. 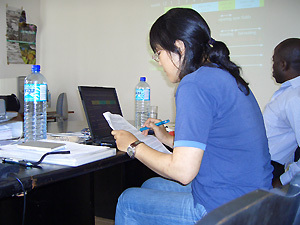 There were active debates among the participants. Presentations were made in PowerPoint. 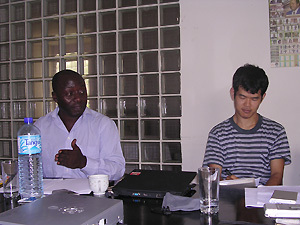 The Japanese students used English for their presentations, while the Cameroon student used French. Though the question-and-answer session was conducted in English, discussions on how to improve conservation projects took place in French as many of the participants were French speakers, and when needed, English interpretation was provided. Initially 25 minutes were allocated for each presentation plus 10 minutes for questions and answers. However many questions were asked about the contents of the presentations and thoughts of each presenter on the projects, resulting in average of 60 minutes for each presentation, far longer than scheduled. 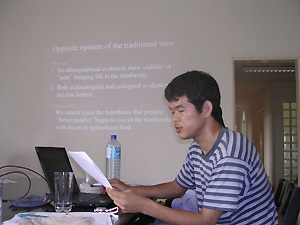 YASUOKA Hirokazu, ASAFAS graduate student, made a presentation (Photo 4) entitled “Foraging Life in the African Tropical Rainforests.” He analyzed molongo, which are extended foraging trips made by Baka hunter-gatherers in the forests several dozens of kilometers away from their settlement in the dry season. He examined the routes of their movements, length of their stay and their utilization of wild animals and plants. The discussions mainly concerned the actual practices of the Baka people’s foraging including the number of animals caught and hunting methods, and how their activities affect the environment, namely, the forests as a whole. In opposition to YASUOKA’s view that foraging for survival should be accepted, some participants argued that the Baka’s foraging itself is a factor in forest destruction, and neither side found it easy to accept the views of the other. However, the two sides were in agreement that researches should continue to monitor the number of animals in the habitat and to research the actual practices carried out during the Baka’s foraging. Mr. Olivier Njounan, a graduate student of Yaounde University, made a presentation (Photo 5) entitled “Baka Pygmies and Collaborative Management of PAs: The Case of Lobeke.” His presentation concerned the problems faced by the COVAREF (natural resource management committee) founded in each region by community representatives for the purpose of effectively utilizing the compensation paid for tree felling and sports hunting by white tourists. In some cases, schools and community meeting places were built using the compensation money, but in many cases, the whereabouts of the money are not known. He pointed out the difficulties involved in effectively utilizing the compensation and integrating the opinions of the Baka people, due to the fact that the farmers enjoy an advantage over the Baka. Discussions centered on how to allow the Baka people to express their views actively in COVAREF. As a solution, a proposal was made to distribute the compensation funds separately to farmers and Baka pygmies and to increase the number of Baka members of COVAREF, in which farmers have a larger share. HATTORI Shiho made a presentation (Photo 6) entitled “Ethnobotany of the Baka hunter-gatherers in South Eastern Cameroon: Utilization of Marantaceae Plants.” Focusing on the use of plants, particularly of Marantaceae, she analyzed the ethnobotany of the Baka hunter-gatherers. The discussion that followed her presentation primarily concerned how to use ethnobotanical research such as this in the actual practice of nature conservation. 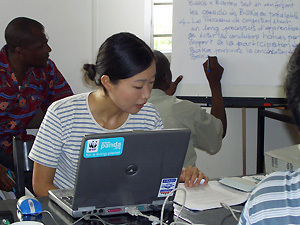 For this, HATTORI proposed conducting detailed researches on plants of the potential market values of non-timber resources, studying the plant use of forest people such as the Baka hunter-gatherers along with forest ecology and building a “forest museum” to preserve their rich knowledge on forests. She was asked a question regarding the possible extinction of Marantaceae as a result of the massive use of this plant by the Baka people. To this, she answered that Marantaceae proliferate even among secondary vegetation and that there are no reports indicating any decrease in their number. Further, Dr. Jean Michel O’nana, the botanist present in the workshop, also explained about the ecology and the growing properties of Marantacea, and provided reassurance that there is no likelihood of its extinction. SHIKATA Kagari gave a presentation (Photo 7) entitled “Interactive Relationship between Human Activities and Forest Environments: A Case Study of Bakwele Farmers along the Dja River.” After explaining about the living practices of the Bakwele farmers, including their shifting cultivation as well as the history of their migration, she provided an analysis of the impact of such human activities on forest dynamics. Some participants pressed her hard, asking for a quick answer on whether the Bakwele either “destroyed” or “preserved” the forest. In response, she stated that it is too early to make a judgment at this stage and that the answer should be sought carefully, by analyzing various materials and data. Practical questions were also asked about the reasons for choosing the research field and about research methods. When all the presentations were over, recommendations for the conservation project were read out based on the presentations (Photo 8). 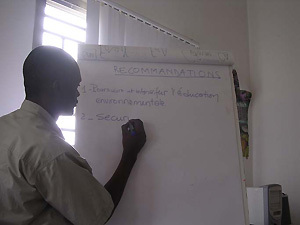 Concrete recommendations were made, including: to conduct continuous monitoring research on the foraging of the Baka hunter-gatherers; to increase the number of Baka members within COVAREF; to use non-timber forest products; and to conduct detailed research on the environmental use of the people including their impacts on forest dynamics. Finally, Dr. Leonard Usongo, who is in charge of the project, stated that serious efforts will be made to integrate the research achievements presented at the workshop, no matter how difficult it might be. He expressed his hope to continue to organize meetings such as this to hear the views of researchers who have long been engaged in the field surveys, and he thereby concluded the workshop. The workshop began at 10 a.m. and, after the coffee break that followed YASUOKA’s presentation, continued until around 4 p.m., long after the scheduled closing time. After the workshop, a modest dinner party was held, and the topics that could not be fully addressed at the workshop as well as future cooperation between ASAFAS and WWF were discussed. As was also the case with the previous seminar, the presentations by ASAFAS graduate students, which were based on their field research over a long period of time, seem to have had a fresh impact upon the participants. However, some participants seemed to be strongly prejudiced toward the idea that human activities themselves are one of the causes of forest destruction, and the positive perceptions of the ASAFAS students toward people’s impact on the forest environment often conflicted with those held by the members of the conservation side, who hastily demanded a quick answer, asking whether the people are either “destroying” or “preserving” the forests. However, almost all the participants, including those promoting the protection project in the South East Cameroon, seemed to possess only a stereotyped image of the Baka hunter-gatherers and Bakwele farmers, and it was extremely useful that we could provide them with the firsthand information we obtained in our field studies. The participants became familiar with the reality of the livelihood of the people through our presentations and discussions.